Cycling has been a popular sport since the bicycle itself was first introduced around the middle of the 19th century. Not long after bikes became a popular method of personal transportation countries around the world began paving roads to make travel easier, competitions such as the Tour de France popped up (the first Tour was held in 1903), and bicycle enthusiasts began to organize clubs and organizations dedicated to their favored pedal-driven vehicles. CLIMB is a group of cyclists with a common interest in not only biking across hills and wooded trails, but also in protecting and preserving the parks used by riders on Long Island. Founded in 1990 as a non-profit advocacy group, CLIMB organizes several weekend rides for its members every month while working to educate the community about eco-friendly and responsible ways to use trails. Volunteers within the club also help to build and maintain trails all over Long Island. The Huntington Bicycle Club sponsors rides led by trained professionals every weekend from spring through November. Regular rides start on Smith Street in Greenlawn at 9:00 AM, and there is even a racing team for faster riders. During the off season, many riders will get together to set up their own smaller group trips, making the club a great way to bike all year long. 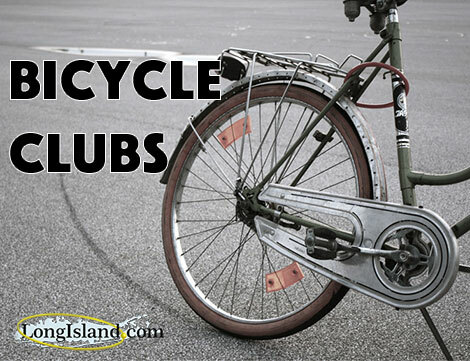 Since 1975, the Long Island Bicycle Club has been helping riders of all levels get together and share their passion for bicycling. A standard ride is held every Saturday, Sunday, and holiday at 9:00 AM, departing from Westbury High School and generally pausing at the Syosset Fire House around 9:45. Today there are four individual subgroups to accommodate riders of varying strengths and speeds. The Massapequa Park Bicycle Club caters to cyclists of all levels, and is one of the most active clubs on the Island with rides on weekends, Tuesdays, and Thursdays. In addition to the regular weekly schecule, MPBC also attends special events such as the Tour of the Hamptons and The Ancient Mariner Century Ride, and holds away trips to Cape Cod and Lancaster, Vermont. Much of the club’s riding takes place on smooth public roadways, but some groups will also hit the mountain trails during cooler months. SBRA is Long Island’s largest cycling club; it has been helping riders get together since 1977 and today organizes events and rides all year long. Trips include short, easy rides for beginners, slightly quicker tours with snack breaks, and faster, more difficult rides for challenge-seekers and competitors. Volunteers set up rides that start between the middle of Suffolk County and the East End, offering a wide variety of scenic routes to members.